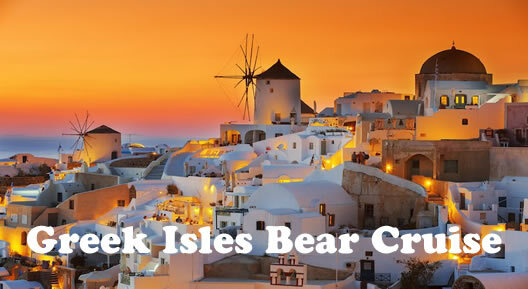 Join your bear buddies and friends on as we sail the the Greek Islands and experience the best of Greece with all your senses. 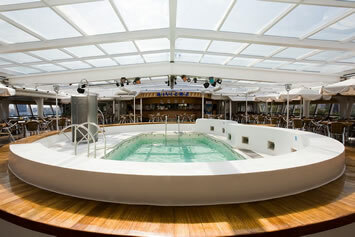 What’s really special: the ship will spend overnights in Mykonos and Santorini. This means you can enjoy a taste of authentic Greece after dark! The Mediterranean is built on myths, history and warm people. There’s nothing you may want that you can’t find here. Book a cruise now and give yourself the gift of a lifetime! 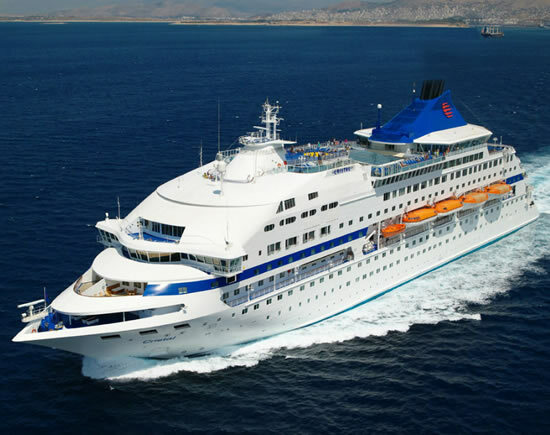 Come and be serenaded by the romance of the Aegean on our brand new “Idyllic Aegean” seven-day gay bears cruise. Visit five of the most enchanting Greek island destinations dotted around the Aegean Sea, where culture, history, pristine beaches and fishing villages suspended in time all await. 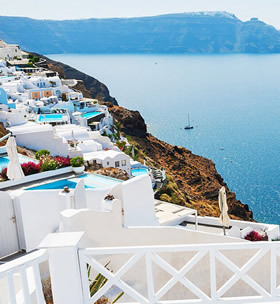 There’s something to suit every taste on our extra-special cruise, and with overnight stops in Santorini and Mykonos, come and unravel the best-kept secrets of these sun-soaked shores by night. And you can choose to spend the day in Samos instead of visiting Kusadasi for a truly authentic Greek experience. 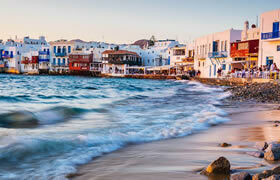 To travel the Aegean sea is to travel through history. A welcoming basin, protected from extreme weather has been inhabited for aeons. The entire spectrum of blue and green shades paint the scenery of the region interrupted only by small white paintbrushes to mark the settlements the locals build since the beginning of history. It’s difficult to pick your destinations but there are some spots that are unmissable. Take for example the martian-like island of Milos, home of the celebrated Venus de Milo, dazzling with its breathtaking beauty, stunning beaches, amazing sunsets, picturesque villages and warm hearted people. 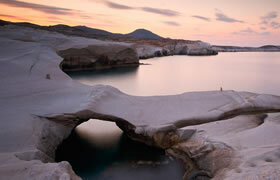 Santorini shares some star qualities with Milos but she is the queen of the Aegean. Only a poet can describe with words this unique experience filled with colors, sounds, sights, flavors and emotions. 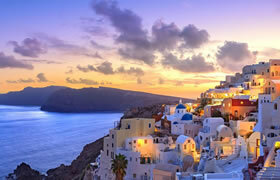 Pristine beaches, traditional architecture and cosmopolitan sunsets are only few of Santorini’s indisputable charms. Mykonos needs no introduction. The nightlife remains to be surpassed by any other as well as the luxury and beauty of the island. 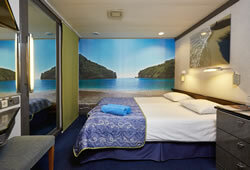 A small blue rock inviting all types of travellers to its sandy blonde shores. 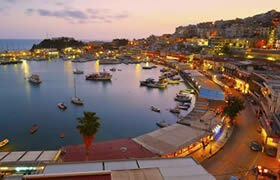 The largest island of the Aegean is Crete, the birthplace of writing and a national treasure of history and landscapes. 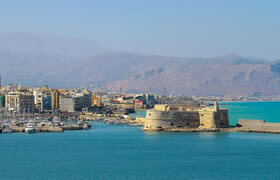 The capital, Heraklion, invites you to medieval adventures and just a few kilometers away you time travel to Minoan Crete. The hospitality of the locals and the quality of every aspect of your experience will leave you wanting more. The crossroad of civilizations and history, Kusadasi, welcomes you in its port and old caravanserai and leads you to the ancient city of Ephesus. The excursion to the ruins will travel you through time to glorious empires and forgotten gods. 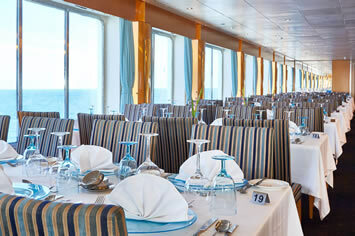 All of Celestyal Crystal dining areas, lounges and bars have been carefully designed to accommodate and preserve the intimacy and comfort one expects while cruising. Head over to the Amalthia and Olympus restaurant for some fine dining, or to Aura Grill and Leda buffet for something tasty, quick and easy. Both places serve dishes you won’t forget soon! At the Helios bar you can enjoy a cup of coffee, while at the Horizons, Muses or Eros Lounge & Bar you can have your favorite cocktail. If you feel like something cozier, you can always relax at Thalassa bar for a night drink, while you indulge in some stargazing. At Celestyal Cruises, we do everything we can to make sure you can relax while you enjoy the delicious gastronomy that makes our cruises unforgettable! Cruise vacations are for pampering, disconnecting and treating yourself. 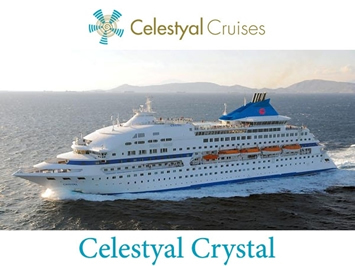 Onboard Celestyal Crystal you can do it all. 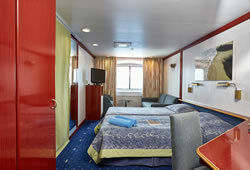 Our revitalizing onboard spa is where all your day-to-day worries are left at the door. 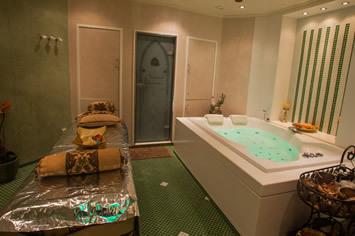 Choose any of our professional spa treatments and packages that include several types of head and body massages such as Balinese Shiatsu, classic Swedish massage and aromatherapy as well as cleansing facials, honey and sugar body exfoliation, hot stone treatments and mud wraps for a rejuvenating and invigorating cruise vacation. Just remember to book your appointment in advance to avoid disappointment. Our cruise ships all come with well-equipped gyms where you can keep up with your daily fitness routine or even try a new workout regime. Start your morning with a stretching program to feel ready for the day ahead, or come to the gym at the end of a day to disconnect with a motivating exercise program. 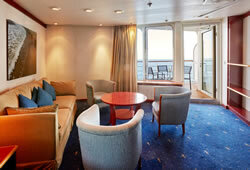 Feel like getting your blood pumping at sea? Learn new moves at a Zumba class or test your nerve with a game of ping pong or darts. If you’re more of a spectator, just stroll on up to the deck and watch all the excitement unfold while enjoying the good weather. 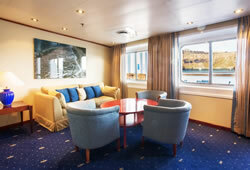 Our onboard salons add a touch of glamor to your vacation. Expert beauticians, hairdressers, manicurists and pedicurists will pamper you and make you feel fabulous as you get ready for Gala Night or cocktails with your loved one. And as we only use the best products, your fabulous feeling will last even longer - just remember to book an appointment in advance as our salons are very popular. What’s more, our salon packages make great Bon Voyage Gifts! 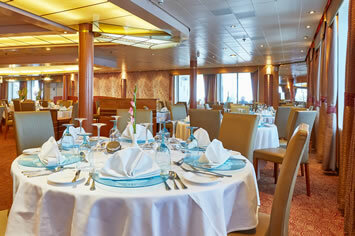 Our onboard quizzes and games guarantee a night of pure entertainment. We have lots of different quizzes on the go like general knowledge, music and a cruise quiz, as well as many other games and board games including Name That Tune, Pictionary, Guess the Celebrity, Stop the Bus and Men vs Women. There are also electronic games to keep every generation entertained such as Wii Sports and many more. A port since antiquity, its seemingly infinite rows of quays are filled with luxury yachts and the comings and goings of people visiting the city of Athens or heading out to the blissful Greek islands. Further along the bay, you’ll find the charming port of Pasalimani where the laid-back atmosphere provides an escape with boutiques and secluded eateries. 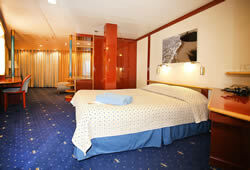 Piraeus is your gateway into one of the world’s oldest cities. Venture into Athens alone or join a guided excursion from the cruise ship to discover the city’s ancient monuments, iconic landmarks and an open-air museum that’s like nothing you’ve ever seen before. Dramatically emerging from the Aegean Sea before you, you’ll be spellbound by Milos’ contrasting volcanic landscape that’s full of refreshing surprises. Its coastline reveals surreal shapes of sculpted rock that captivate viewers for hours, juxtaposed with quaint white stone fishing villages that blend seamlessly into the landscape. Stepping off the cruise ship, a laid-back Cycladic island retreat awaits. Find peace and tranquility on one of the many beaches and feel the cooling, refreshing effect of the Aegean as you swim in its serene sea caves. Marvel at Cape Vani’s geological formations and travel along its ever-changing coastline to admire multi-colored sea cliffs at Paleochori and see evidence of how the island’s history was shaped by mining. Arching its way around a central caldera, the island’s volcanic coastline spoils you for choice. Near Trypiti village, you’ll be able to explore one of the most ancient monuments in Christianity - the Milos Catacombs, where expansive underground chambers and passages were carved into the volcanic rock. Or sit back and relax in one of Milos’ quality terraced tavernas serving only the freshest catch of the day, discover colorful boathouses that magically emerge from the sea in Klima and stroll along Plaka’s hilltop cobblestone streets. Find time for yourself on one of the many white sandy beaches in and around Kusadasi such as Diamond Beach, Paradise Beach or Love Beach, where you can try your hand at windsurfing or even jet skiing. 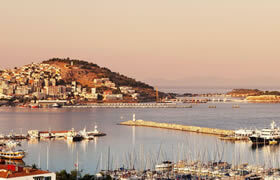 And there’s no shortage of good times in Kusadasi: weather that’s always on your side, a chilled, laid-back atmosphere and ancient sites on its doorstep. In the city, itself, stroll around the Fortress of Kusadasi on Pigeon Island and discover city walls that protect historic gems such as the Fortress Mosque. But head out into the sun-soaked hills above the Aegean coast, and you’ll come across some of the most important archaeological sites in Europe. All prices are per person, occupancy selected, and include all meals, accommodations, unlimited beverage package, 3 selected shore excursions, gratuities, and entertainment! 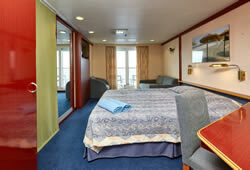 Taxes of $250pp, and optional insurance are additional. A deposit of $500 per person is required at time of booking. Final payment is due 90 days prior to sailing.